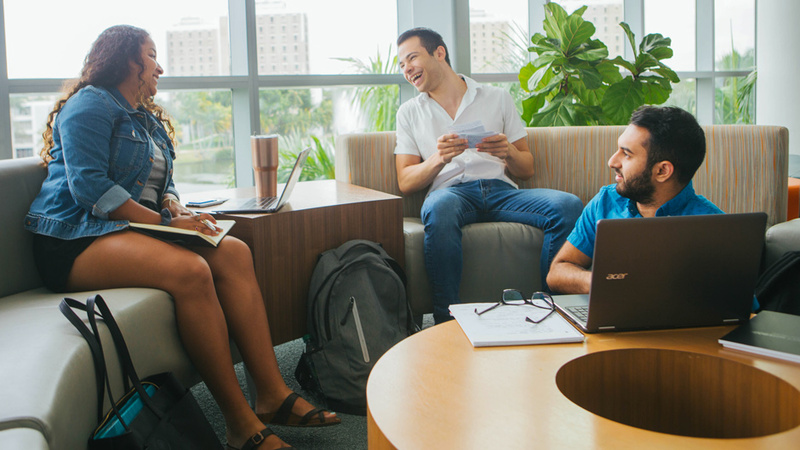 One of the things that sets the academic culture of the U apart from other schools is the number of special programs that can be found on campus, each one giving students a unique experience. One of those programs is the Advanced Program for Integrated Science and Math, otherwise known as PRISM. PRISM is known across campus for connecting students with other people passionate about STEM and helping the students grow into the future leaders of their field. Want to learn more about it? Read on to hear it straight from PRISM students! Steven Lang: I'm a junior from Miami, Florida. My major is neuroscience and I’m graduating early this spring. Sahil Verma: I’m a chemistry major and a junior from Pensacola, Florida. Akshata Gunda: I’m a junior but I’m graduating in spring of 2019. I’m studying chemistry and doing a minor in medical humanities. How would you describe PRISM? Steven: I've described it as being like an honors pre-med-type of experience. You're in more of a close-knit class. You're taking the same major pre-med classes you would to fulfill those requirements that would be helpful on your MCAT or something like that, like your intro to chemistry, organic chemistry, biology, and physics, which are really the foundation of the pre-med curriculum, although there's no pre-med major. So, it'd be those classes except it's in a much more intimate setting. Sahil: I would say it’s a very streamlined program and is very accelerated in math and science for the University. What it does is it allows for those students who are interested primarily in the STEM program, such as mostly biology and integrated chemistry, to have a streamlined way of achieving their major. Akshata: I would consider PRISM an honors program for science majors, people in the pre-med track or pre-research track, who are willing to put in extra work to excel in their academics. And the benefits that we get out of it include smaller class sizes and a nice transition out of high school, because we stay with the same group of students for the first two years of college. You get better relationships with your professors and really get to see the sciences in a moralistic way. I remember my first year, even though we were learning biology, a lot of our practice problems would involve the chemistry and the calculus that we were learning in our other PRISM courses, so it tries to find a way to make science interdisciplinary. What’s the PRISM community like? Steven: I found a lot of friends in that small cohort and was able to make study groups with them and bond with them; they became my closest friends. It's not necessarily a competitive feeling there. It's more like these people are really smart and they work really hard; and we have similar goals and all want to support each other. It sounds cheesy, kind of clichéd, but it's really sweet. Sahil: Every professor I have met has been probably an absolute expert in their field. I do not have anything bad to say about any one of them because, number one, they are just so enthusiastic. Number two, they are very well informed about what’s going on in their course, and, number three, they have a great hold on their course and what they expect of students. Because of that, they are just, I would say, perfect professors in every way. Akshata: PRISM helps you find friends really early on, who help you and support you, because, at the end of the day, we’re all in it for the same goal. So, you know, let’s help each other rise up. I would say there was a little bit of competition but in a very healthy way. How did PRISM help you in your career here at UM? Steven: I think it fosters a much closer relationship with the professors. [Our program director] Dr. Wilson is amazing and I think everyone in our cohort feels comfortable just to go talk to him, like he's a regular guy and he's here to help you and it's incredibly helpful. And I think they're really trying to create opportunities for students to succeed at the highest level that they can. Sahil: Personally, I actually had a little bit of difficulty when I first started freshman year because I didn’t know anyone here at the University. But PRISM allowed me to get on track very quickly and understand what my priorities were and how to actually apply those priorities. It actually taught me more about how college courses are taught than any other course has, because the program shows that it’s not just memorizing how the formulas work. You have to know in-depth how they function and what it means to actually know something. Akshata: The difficulty of other courses kind of expanded our minds. We weren’t just learning about a [chemical] reaction, but learning about how it’s used, and that’s helped us to learn about the medical field or the scientific field more. So, we’re able to take that next step to keep excelling. Want to know more about PRISM for yourself? Check out miami.edu/PRISM!